In this series about mathematical notation and its impact on the learning of mathematics, the previous post looked at the use of the “=” sign to indicate equivalence or identity, and then looked at an alternative notation. In this post we will look at the “=” sign as used in equations. The use of the “=” sign to indicate that the left side 5x – 6 and the right side 9 are the same for some suitable value or values of x – and that we are interested in what that suitable value for x is – is distinct from the “do this now” use, and also different from the “the left side and the right side will always evaluate to the same value regardless of the chosen value for x” use. In an equation, the equality of left side and right side is something that you receive as a hint or a clue; it is a useful fact with informational value. In the example above, the equation tells you something about what x must be, and in solving it, we find that it indeed allows us to nail down precisely what value x must take. 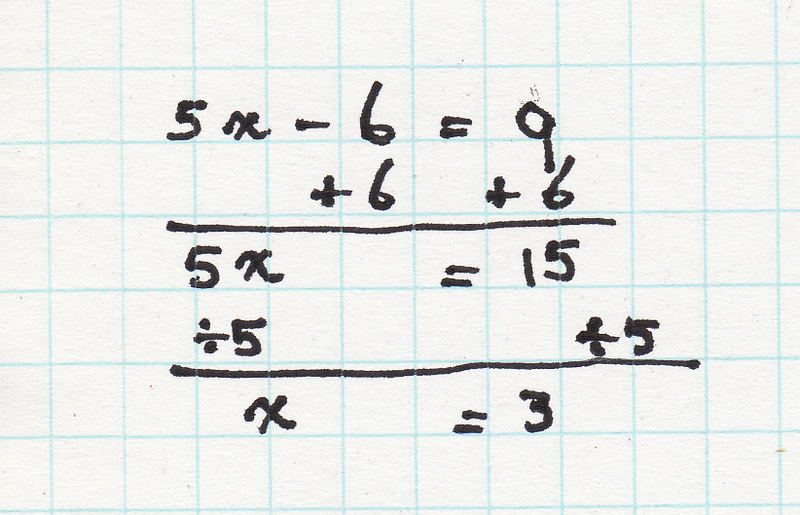 What you see in the top line is the left side 5x – 6 where “x” has been replaced by the solution that we found: 3. The left side should evaluate to 9, but we don’t know yet if this will pan out. By the time we come to the third line, we have 9 = 9, and this, of course, checks out. 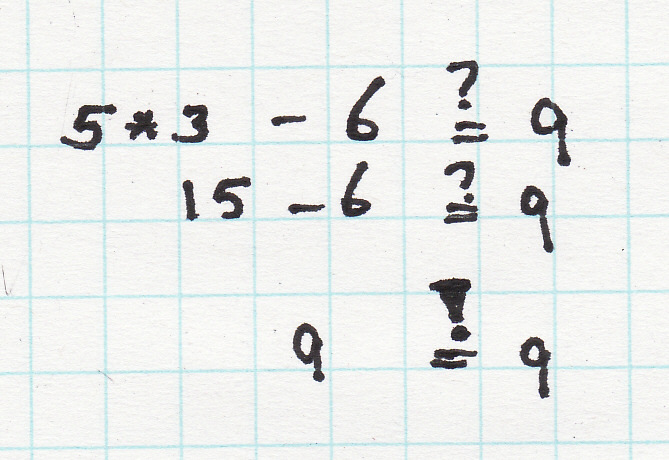 The notation shown, with the question marks over the “=” sign while we are still checking, and the exclamation point over the “=” sign once we have verified that the solution does indeed check out, this is the notation that I propose teachers use. It is a simple notation, like an annotated “=” sign, that makes it viscerally clear that we are not yet ready to assert that left side and right sides are equal, but that we are working towards that goal. And of course, if we had made an error along the way, we might expect that during checking we’d discover that left side and right side are not equal, and that the equality check does not pan out. In that case, our final check line would use the “≠” sign.